Taking the cheap local bus from Leon to Las Peñitas Beach is easy! 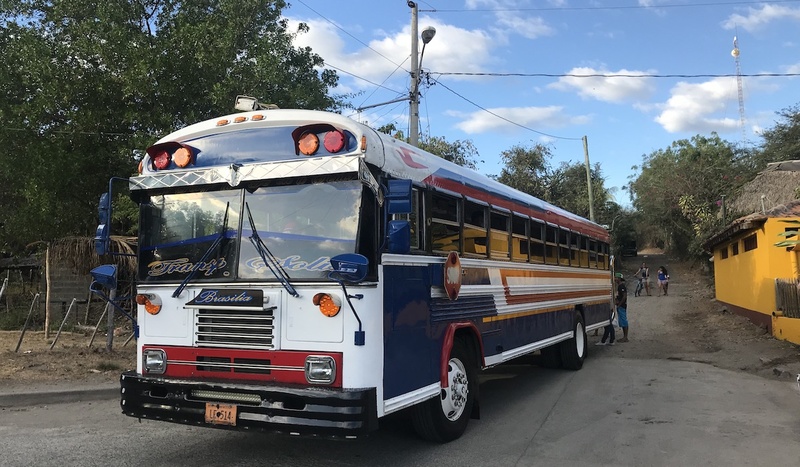 If you’re on a budget and want to try a local transportation experience, I highly recommend taking the C$18/$0.50USD “chicken bus” to the beach, rather than a $12USD tourist shuttle. The Leon to Las Peñitas route begins at Sutiaba Market. 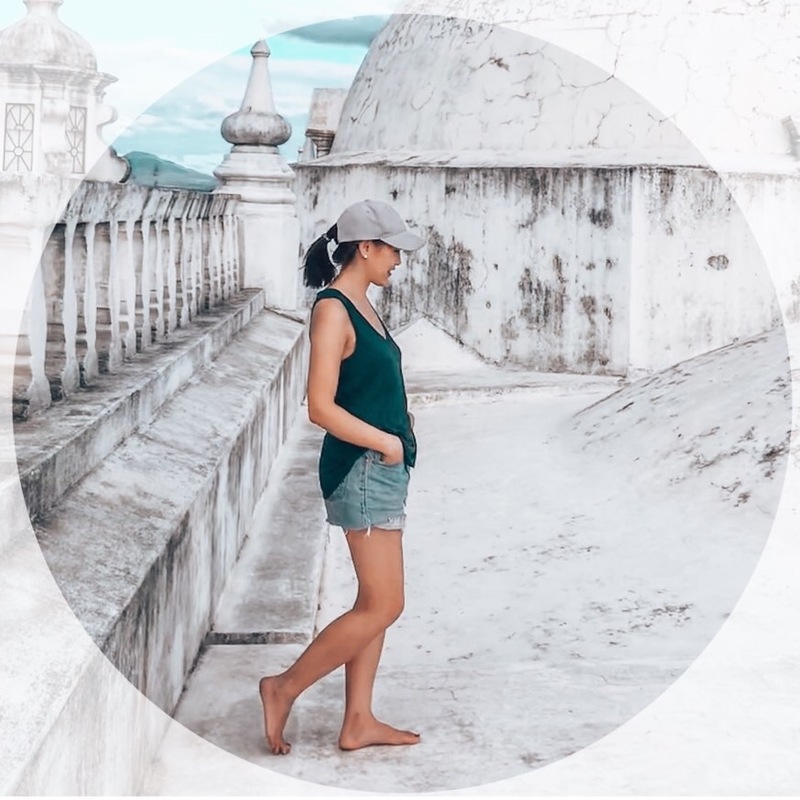 You can walk to the market in about 20 minutes from the central part of Leon, or, you can take a short cab ride to the market (we paid 25C per person). 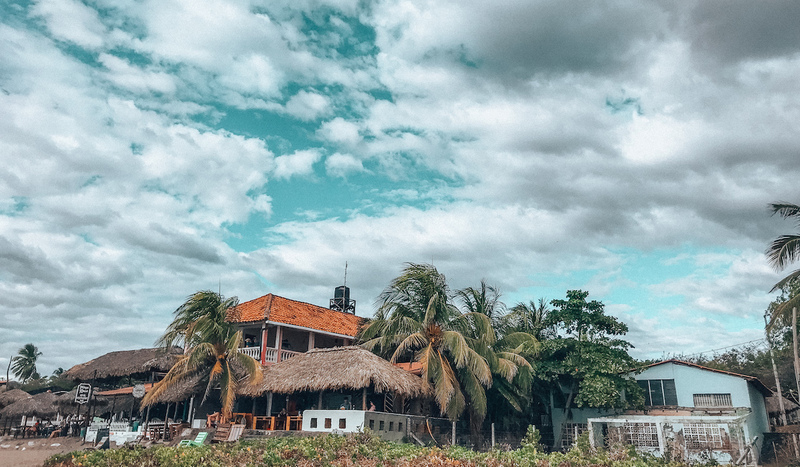 Just ask for Suitiaba (pronounced: soot-ee-ya-ba) as the destination, or if you need to be more clear, something along the lines of: “Suitiaba: el autobús a la playa“. The first bus of the day departs from Sutiaba Market at 5:00am; it’s what the tourists call a “chicken bus”, which is literally a North American school bus. Some are painted, but others are still that yellow school bus colour. In fact, the similarity is so uncanny, we heard the story of another traveller who let the bus pass by her because she assumed it was a local school bus! The Leon to Las Penitas “Chicken Bus” at Its Final Destination at Las Peñitas Beach. The bus was ready to leave as we arrived via taxi to Sutiaba market. We got on through the back doors as one of the last riders, so it was standing room only by the time we were on. The fare is C$18 Cordoba per person (which is about $0.50USD); someone comes around to collect your money during the ride. Needless to say, it’s cash only! The bus ride is about 45 minutes. There are two beaches you can go to with this bus route: Poneloya or Las Penitas (the more popular beach). There’s a “T” in the road on the way to the beaches, the first beach stop (to the right) is Poneloya, and then the bus loops back East to Las Peñitas as the final destination. 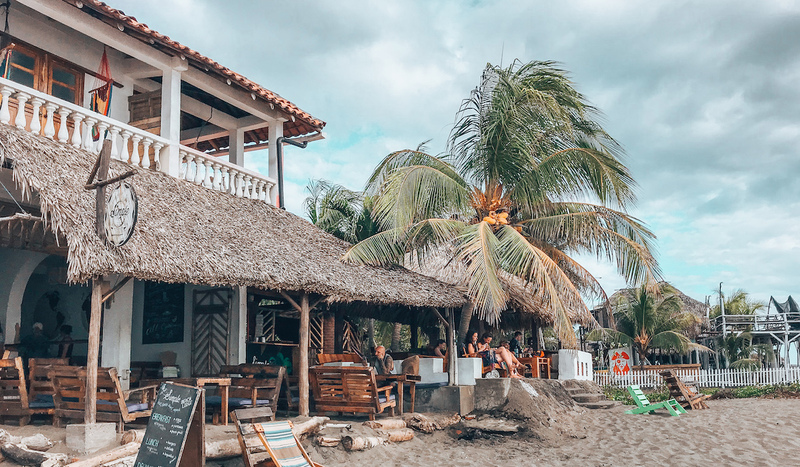 We went to Las Peñitas on a Tuesday afternoon and it was a lot quieter than we expected; a sleepy little town with a main dirt road lined with beach hut restaurants, parallel to the beach. 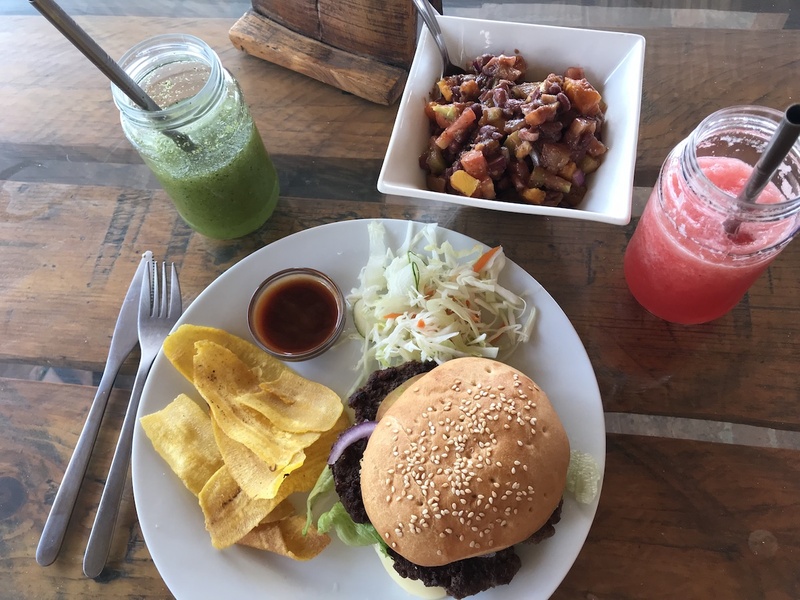 We had lunch at Simple Beach Lodge, which is a Las Peñitas hostel with a beachfront restaurant which serves typical Western beach food like burgers, sandwiches, salads…but served with fried plantains instead of French fries. It’s always nice to cool down with a fresh juice by the beach so I had a watermelon and pinapple juice. Steve ordered a mojito, but he forgot to ask for the shot of rum, so he had a virgin mojito instead – oops! Steve went swimming in the Pacific Ocean. The waves break really hard, so it’s perfect for surfers looking to catch a wave (surfboard rentals are only $6USD), but too rough for me to swim in. Steve, on the other hand, had no problem diving right in. I entertained myself by walking around to take photos of the restaurants and the beach, while he went swimming. If you go to Las Peñitas between September to December, you can see Sea Turtles laying their eggs and/or baby turtles hatching. To get back to Leon, the last bus leaves Las Penitas at 6:30pm from the turn-around by the restaurant/hotel Barca de Oro. If you happen to miss the last bus, you can ask any of the local bars or restaurants to call you a taxi back into Leon, which costs about $10 to $15USD.